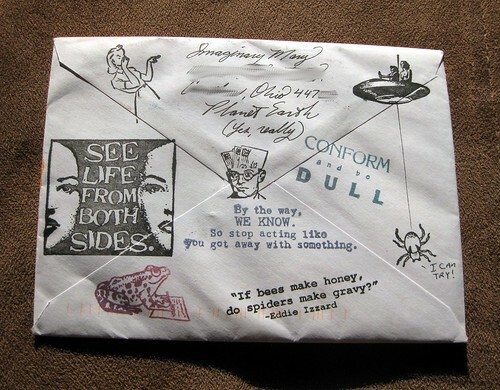 Recently I admired a fantastic envelope on Pinterest (warning: Pinterest is very, very addictive), the fine work of JellySock, aka Imaginary Mary, aka Mrs. Sawbones. She called it map-themed mail art, and I thought it was breathtaking. Imagine my surprise when I pulled that very envelope out of my mailbox this afternoon!! I assure you, this gem is even more beautiful in person than it is in a photo, but I had the advantage of some golden afternoon sun on the couch, so I photographed it in a different location than I usually do for letters. I had to get an angle shot to show off that snazzy glitter, though it is another thing that must be appreciated in person. (Is that glimmer mist? My vote is yes.) LOVE the frog (I stand corrected - 'tis actually a fish with legs!) bearing the envelope! Is that an Alice in Wonderland image? This mail artist extraordinaire has an incredible array of fascinating rubber stamps. "Conform and be dull" made me laugh out loud. 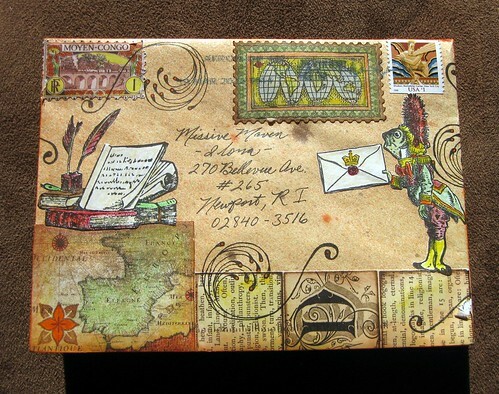 For more fabulous mail art, please check out her Mail/Envelope Art board on Pinterest, and her Flickr photostream. Her Twitter stream is full of fun mail links, too. Very cool. I need to start getting busy, getting busy. Falling behind on my mailing. Still recovering from the last mailing. I was going to thank you for the link then realised how much time I could lose just looking! Yeah - the frog is from the Duchess's house from Alice in Wonderland. Wow. Wow. And wow. They deserve the best archive method ever. So beautiful. Sooo beautiful! I can imagine how you have felt when you have found this in your mailbox! That's my country in the left bottom corner *giggles*. Great letter! Fantastic mail art! 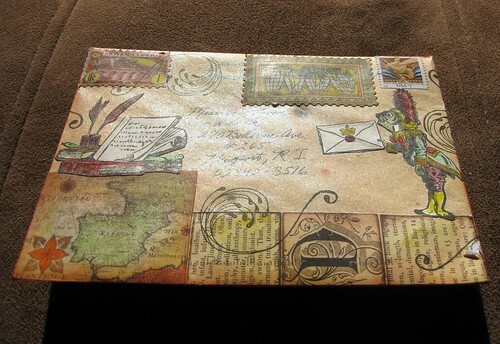 It combines two of my favorite things ~ letter writing and travel!